...plus c'est la meme chose. Translated from the francais, this expression means that gay-assed party photos have been with us forever and it shall always be thus. 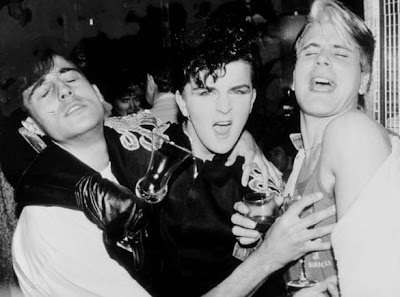 Here's a particularly amusing one I saw this week--from left to right, it's the great Andrew Ridgely, of Wham!, Steve Norman of the newly-reunited Spandau Ballet, and Steve Strange of the easily-forgotten Visage. On the positive side, I love this new Decemberists song, "The Wanting Comes in Waves/Repaid." I didn't realize they could rock out like this, it's awesome. The new album is a proggy concept piece about how a little girl goes walking in the forest and makes friends with a midget, and then plays a tune on a pan-flute that causes said midget to grow to the size of a normal human adult. That vid was fan-created. I think "memoryburn7" did a pretty fair job there. That picture looks just like you, me, and Potsy when we go out. Minus of course the groping, make-up, elbow high leather gloves, fruity drinks, and overt homosexuality. Other than that, it's totally us. did the decemberists play that song when you saw them? it's the chick from what, my brightest diamond? No, they didn't play this. The night I saw them they only played older songs. The next night they performed the new album from start to finish. And yes, I believe My Brightest Diamond's Shara Worden is the singer. Speaking of the new album, I really like it much more than their older stuff. It rocks. The earlier albums seem very dorky. Well, I guess this one is a little dorky too.